Dodge City will be our only runner at Sandown on Wednesday following Pedro Ximenez not gaining a start. Dodge City runs in race five, the Benchmark 64 Handicap over 1800m where he will jump from barrier one with Patrick Moloney in the saddle. 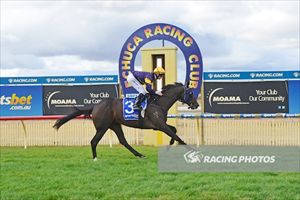 The son of High Chaparral has had three starts this campaign, last time when finishing eighth over 2025m at Kyneton. “He’s trained on well since that last start and he looks terrific,” Moroney said. Dodge City finished runner-up over 1600m at Pakenham second-up and Moroney feels a repeat of that effort can have him in the finish at Sandown. “The draw is a help and from there he should get a lovely run and we’re expecting him to be very competitive in what looks an even race.” Moroney said.